If you are interested in learning more about Google+, or if you are looking to hire a content writer, please email jwojdylo@gmail.com or lesutton@live.unc.edu. I just completed my best Wojdylo Show yet with Ryan Best. You can watch the 15 minute show in its entirety here. One of the main reasons we both feel as if Google+ will continue to grow is the power of search and local business. A few years ago, prime real estate on the front page of Google search was given to “Google Local” results. If you search for “Raleigh Pizza” you will notice there is now a listings bar along the top of search. This is gold, Jerry! Instead of scrolling down, searchers have the opportunity to select a local business. Remember that Google rolled out Google+ Local pages as the new Google listings not too long ago. This means every local business would be very smart to jump on Google+ and get active. Google has added many amazing features to Google+ over the last few years but it is not as easy as social networks like Twitter and Instagram. On those particular social networks a user or business posts a short burst of information (a tweet) or a photo (Instagram) and the work is done. In fact, there are automated programs that will do it all for a business. On Google+, it doesn’t work that way. Google wants human beings to submit the content which greatly reduces the spam. A human, not a computer, must log in to the Google+ profile or page and post content. This can make it quite difficult for the small or medium sized business owner that just does not have the time. Fortunately, there are many Google+ users that will be more than willing to help when it comes to generating content through social media. If you are struggling to build a Google+ audience please feel free to reach out to me at jwojdylo@gmail.com. I will be more than happy to offer a strategy session or even assist with moderating your page. Google+ has built many features within pages that allow multiple page managers and page administrators. This makes it easier for the small business owner to hire someone to increase the activity of their page. One of the main reasons Google+ is not easy is it takes time and effort. Google+ is the relationship social network. I have said it time and again. Facebook is a way to connect with old friends and Google+ is a way to meet new friends and build strong relationships. Hangouts, communities and private messaging make it much easier to develop deeper relationships than a simple “like”. Businesses can benefit greatly as this is a tool that creates a natural word of mouth marketing campaign. Since the day Google+ communities were released, December 6th, 2012, I have staked my claim as the “communities expert”. I wrote this post the second I heard about the release, “Google+ Communities – Here is Why It Will Change EVERYTHING!“. After a share from the head of Google+ himself, Vic Gundotra, I was well on my way to becoming the Google+ guy that knows his communities. Since then I have created over 50 communities with some growing to over 10,000 members. The size of the community is not of importance; the content is. Within these communities I have created an outlet for small businesses to reach a much larger audience. I could not say it any better myself. 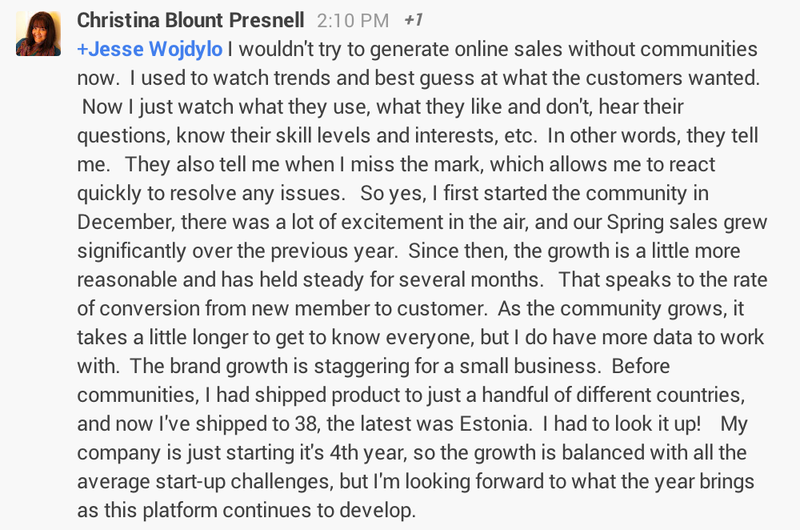 For more on Christina’s Google+ strategy check out this post. Customers now have a way to tell her what they want. Where else can you find this on the web? You don’t have to search specific keywords in Twitter. You don’t have to fight the Facebook Edgerank algorithm. It is all right there for you! Any small business owner knows this is true gold. It is a suggestion card hand written. Not only is it hand written, but a customer can do it any day from anywhere. If any business owner doesn’t see the value in this they need to reevaluate their business plan. As stated before, Google+ is not easy. There is a steep learning curve. You cannot jump on Google+, share a few photos and hope to get 200 +1s. It simply is not going to happen. You must learn to crawl before you walk. I advise most of my clients to start with an 80-20 policy. The first few weeks of Google+ should be digesting information and commenting on other’s posts about 80% of the time while only submitting your own content 20% of the time. As you learn to crawl more efficiently and eventually learn to walk that number will get closer to 50-50. Once you truly understand how Google+ and social media work you can start to post more and become a curator. Unfortunately, most businesses do the opposite. They post their own content 80% of the time and comment 20% or less. In fact, I have seen it as bad as posting 98% and commenting and engaging about 2% of the time. This will lead to immediate failure and the claim that “Google+ is a ghost town”. I have half a million followers that would like to make an argument that Google+ is not a ghost town. If your business is struggling on Google+ or just getting off the ground please feel free to reach out to me at jwojdylo@gmail.com.